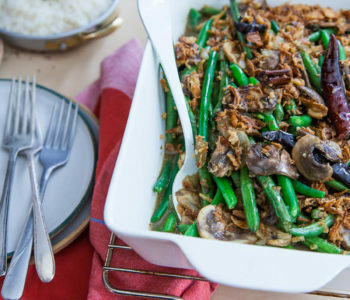 MIX green beans and Tasty Bite® Spice & Simmer™ Thai Green Curry marinade sauce in casserole dish. HEAT oil over medium heat in a large skillet. 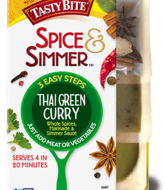 Add Tasty Bite® Spice & Simmer™ Thai Green Curry spices and saute for 30 seconds. ADD onion and mushrooms to pan and saute for 3 minutes stirring consgtantly. 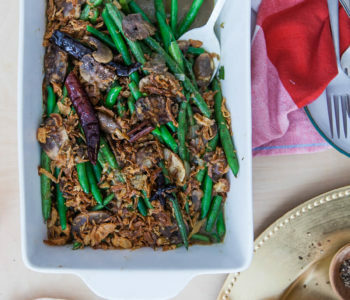 Add Tasty Bite® Spice & Simmer™ Thai Green Curry simmer sauce and heat for 3 minutes. POUR sauce on green beans. Top with crunchy onions. Bake for 20 minutes. Sign up now for a Tasty serving of free coupons and recipes!